emphasis on project schedule and we welcome the challenge of aggressive timelines. The redevelopment of St. Joseph’s Health Care’s Parkwood Hospital campus is among the most expansive civil works projects in the City of London’s history. Completed in advance of the proposed Regional Mental Health Care (RMHC) Facility construction, the enabling works were vital to accommodate displaced parking, provide the required road configuration for streamlined traffic flow, and upgrade and extend services to the proposed RMHC facility. Substantial components of Phase 2 included site servicing, stormwater management facilities, roadways, a parking garage, power plant expansion and utility installation. Construction logistics related to the configuration and maintenance of existing services and utilities proved to be the greatest design and construction challenge. An aggressive implementation schedule required completion of servicing and grading design at the front end of Phase 2, as part of the City’s Site Plan Approval process. Our engineering team delivered a practical servicing design despite complicated field conditions, logistical considerations and budget constraints. The Richard Ivey School of Business is a world-renowned business school that ranks with Ivy League institutions across North America. The facility was a $110 million project to consolidate the Faculty of Business into a central, world class building situated adjacent to Western Road and the campus of Brescia University College. Development Engineering coordinated the civil servicing with the architect, mechanical consultant, LEED consultant, construction manager and landscape architect. The site engineering focused on earning LEED Gold sustainability and environmental credits for such components as a rainwater cistern, onsite stormwater measures, reduced water demand, erosion and sediment control measures, and limited site imperviousness for parking. Quality control for stormwater discharge was accomplished using a passive treatment train approach utilizing grassed swales, landscape buffering, and infiltration trench (French Drain). Traffic management plans were required to outline temporary diversion measures required of the Contractor when work was being undertaken within the busy Western Road. The project’s ‘fast track’ schedule required phased site works, while detailed design of the Phase 1 building was still underway. Grand Valley Wind Farm in The Township of East Luther Grand Valley is situated across undulating terrain with complicated soil and groundwater conditions. Development Engineering served on the successful design-build project team with Carlsun Energy Solutions Inc.
A rigorous approval process and compliance with environmental assessment criteria were satisfied prior to the onset of construction. The strategic planning of access roads and their geometry in relation to the wind turbines was a critical component to project viability and construction logistics. A comprehensive topography assessment enabled the design team to optimize the configuration of site works within project constraints. 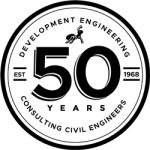 Development Engineering met the requirements of various approval agencies to navigate the project to successful completion with a collaborative value engineering approach by the design team.